Class Day speaker, former Vice President Joe Biden, urged seniors not to succumb to pressures that value “the social trappings of success rather than really making a difference,” but to choose what’s best and most important to them. 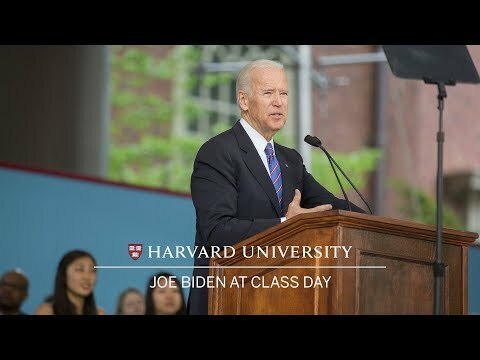 Though these can feel like turbulent and divisive times for many Americans, standing on the sidelines out of apathy or disaffection is an unacceptable option, former Vice President Joseph R. Biden told graduating Harvard College seniors Wednesday afternoon during the annual Class Day celebration at Tercentenary Theatre. Nicknamed “Uncle Joe” for his folksy, gregarious demeanor and lack of pretense, the two-term Democratic vice president who left office in January gave students the “full Biden experience.” At times funny, Biden, 74, an unintentional star of popular internet memes, delighted students by dramatically pulling out his Ray Ban sunglasses and posing for a selfie with College Dean Rakesh Khurana. “Me and the dean in one place. It’s time to break the internet!” he joked. 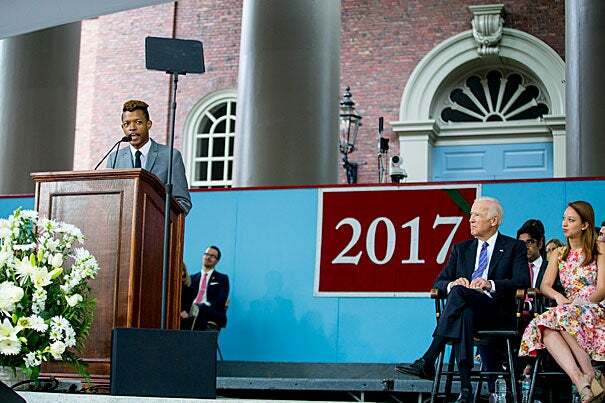 True to form, Biden also spoke earnestly about the enduring greatness of America and its ideals, and about the role that Harvard students and other young adults need to play in shaping its direction at this difficult yet pivotal moment in world history. Biden cited an Institute of Politics survey released in April that showed fewer students plan to participate in public service now than in 2012, and a new Harvard Crimson report that 37 percent of the Class of 2017 who had once considered working in the federal government changed their minds after the 2016 presidential election. “Forgive me, but I think that’s the wrong reaction. It’s your obligation to get engaged,” Biden said. “Don’t fool yourself into thinking that disengaging from the system that you think is broken will hold you harmless from the system’s failures,” he said. Though a Harvard degree opens many doors that aren’t available to others, it’s no panacea to life’s hard knocks, he said, “You can’t cut yourself off from the consequences of a failed political system. You can’t erect a bubble around you and your family” that protects against racism, sexism, violence, political division, economic inequality, the harmful effects of climate change, and other ills. Biden urged the seniors not to succumb to pressures that value “the social trappings of success rather than really making a difference,” but to choose what’s best and most important to them, rather than caving to other people’s perceptions. “My dad used to have an expression: ‘Joey, it’s the lucky person who wakes up in the morning and puts both feet on the floor and knows what they’re about to do and thinks it still matters.’” Successful and happy people understand that it’s about being personal and present with those around them, he suggested. “Resist the temptation to let ‘network’ be a verb that saps the person away,” said Biden. But to fulfill that potential and destiny, he said, “It’s absolutely essential for you to engage in the world around you, engage just like you did on Harvard’s campus,” whether by protesting for Black Lives Matter, or standing in support of dining service workers during their strike last fall, or participating in recent marches on issues facing women, science, and climate. As vice president under President Barack Obama, Biden was particularly influential in foreign policy and national security matters. Prior to that, he represented the state of Delaware as U.S. Senator, a position he held without interruption from 1973 to 2009. Since leaving the vice presidency, Biden has entered academia, leading two new teaching and public policy research entities. In February, he was named director of the Penn Biden Center for Diplomacy and Global Engagement, the University of Pennsylvania’s center for diplomacy, national security, and foreign policy, which will open in Washington, D.C., in the fall. An alumnus of the University of Delaware, Biden also will be founding chairman of the Biden Institute, a research arm of the University’s School of Public Policy and Administration. 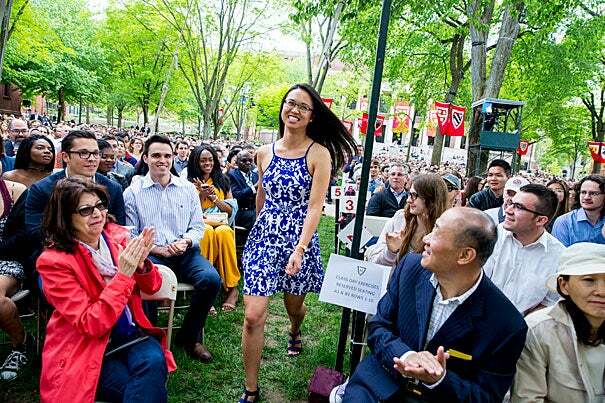 As part of the Class Day festivities, seniors Jennifer Hao and Juhwan Seo were named recipients of the Ames Award, Hao for her tireless commitment to the Youth to Youth (Y2Y) Homeless Shelter in Harvard Square, and Seo for his efforts to allow history or literature concentrators to focus on people of color and other identities. The honor, given to seniors who demonstrate exemplary leadership and a passion for helping others without fanfare or acknowledgement, is given in memory of alumni Richard Glover Ames and Henry Russell Ames. The brothers died in 1935 while trying to save their father, who had fallen overboard during a storm off Newfoundland. 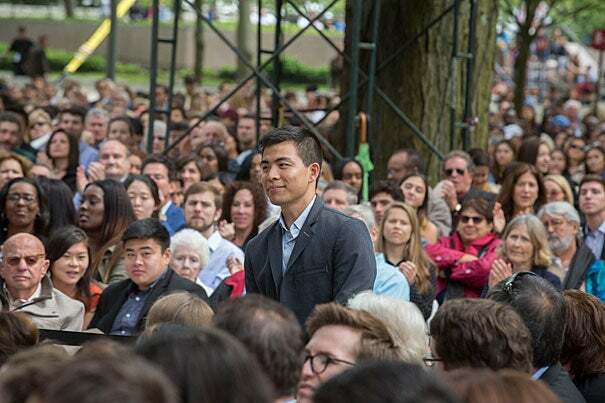 Delivering the Harvard orations, traditionally a formal reflection on students’ years at Harvard, were Jonathan Roberts and Bessie Zhang, while Declan Garvey and Rachel Stromberg were the Ivy Orators. Class Day is a less formal prelude to Commencement Exercises. Chosen by seniors, the main Class Day speakers are often notable performers, writers, political leaders, sports stars, and social or political activists, and sometimes College alumni. Past speakers include actress-writer Rashida Jones ’97 (2016), former President Bill Clinton (2007), Nobel laureate Mother Teresa (1982), newspaper columnist Jimmy Breslin (1971), and Civil Rights icon Coretta Scott King (1968). Watch the full video of 2017 Class Day Exercises. Now in her 10th year on the board, including the last three on the executive committee, Susan Morris Novick ’85 will succeed Martin J. “Marty” Grasso Jr. ’78 as president of the Harvard Alumni Association.